Dumpling Days by Grace Lin. Grades 3-6. Little, Brown Books for Young Readers, January 2012. 264 pages. Reviewed from ARC snagged at ALA.
"Traveling is important - it opens your mind. You take something with you, you leave something behind, and you are forever changed. That is a good trip." - Pacy's dad (page 2*). When Pacy and her family leave for a month-long summer trip to Taiwan, Pacy's not at all sure about the trip. She doesn't speak the language, she's going to miss her friends, and she's just not convinced that it's going to be any fun. It's true that many things seem harder in Taiwan: ordering restaurant food, using the bathroom, even an art class (Pacy's best subject!). But sometimes the most difficult things are the things most worth doing and her adventures in Taiwan will bring Pacy closer to figuring out her own identity and growing closer to those she knows best. Grace Lin perfectly captures a child's-eye view of family vacation and reading this book was liking taking a trip to Taiwan myself! Details from the architecture to the folklore to the food (Oh! The food!) paint a picture of Taiwan that will have readers eagerly devouring the pages. I didn't want to stop reading because I didn't want my vacation with the Lins to end! This is a perfect book for American kids to explore different cultures. It's interesting and accessible with lots of tidbits about Taiwan. Ms. Lin also explores the culture clash Pacy experiences being from the US and visiting her parents' homeland. Pacy feels like she doesn't fit in anywhere. In her New England hometown, she doesn't look like everyone else. In Taiwan, she looks like the people but she can't speak their language and doesn't know their ways. Even McDonald's is different in Taiwan! Although culture clash is definitely an element of this book, it's not the only focal point. This is a story about Pacy and her family. Being the only American kids around, Pacy and her sisters grow closer. Sometimes it takes a journey of thousands of miles to get to know the people you live with every day. And as Pacy learns the stories of her Taiwanese family members, she grows closer to them, too. There are two previous Pacy books, The Year of the Dog and The Year of the Rat. I recommend you read them because they are awesome, but Dumpling Days stands quite nicely on its own, as well. You may also want to pair this book with Grace Lin's Newbery honor-winning book Where the Mountain Meets the Moon. Seriously, don't miss this one! This is definitely one of my favorite books I've read this year! 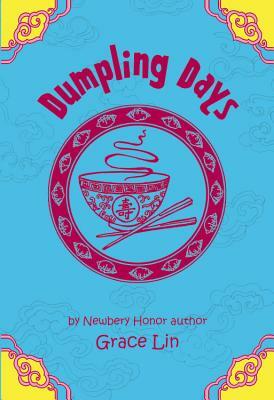 Dumpling Days will be on shelves January 2, just in time for Chinese New Year (January 23 this year!). Make sure you've got this and all the Pacy books in your collection!